In the Summer of 2015 with the help of the Prince's Trust Enterprise Programme I launched my gift box business, BearHugs. I recently answered some questions for the Prince's Trust about my experience. I thought I would share my responses here in case they are of help to others considering accessing the programme. What were your circumstances before coming to The Prince’s Trust? Have you had any problems that have affected you progressing? Until several years ago things were very much going 'to plan’ for me. I’d graduated from university and moved to the Outer Hebrides to start a dream job in a dream location as a Speech and Language Therapist. I loved the work and, despite at times being challenging, it was very rewarding. Unfortunately, not long after starting my job I started to notice a gradual decline in my health. Around a year later, I had to stop working entirely. My health deteriorated to the point where I was no longer able to walk, wash or, at times, eat unassisted. I was entirely dependent on others. I could only read or watch television for ten minutes at a time before feeling too unwell and having to stop. Seeing friends for just half an hour would leave me in bed for days struggling to tolerate noise and light. I recently found out that my symptoms have been caused by Lyme Disease. I feel very lucky to have seen improvements in my health since then. I am now able to concentrate for far longer and leaving the house doesn’t leave me so ill. My mobility has been gradually improving, and while still significantly restricted I feel hopeful about the future. Before coming to the Prince’s Trust, I had just moved back to Sheffield from the Outer Hebrides to access better health care. I was seeing some improvements and working on building additional activities into my life that gave me a sense of purpose. I was making jewellery, which I still sell and donate the profits of to the ME Association, and writing my blog about living positively around chronic illness. How did you feel about life and employment/self employment? When I had to stop working as a Speech and Language Therapist, I was devastated. I’d worked really hard to be able to get the job and took a lot of pride in my work. I loved working with kids, their parents and had fantastic colleagues. I had always considered Speech and Language Therapy a ‘for life’ career so when it was something I was no longer able to manage it was difficult for me to get my head around. I knew that I needed to find something that I could get that feeling of satisfaction and pride from but that would also account for my new circumstances. 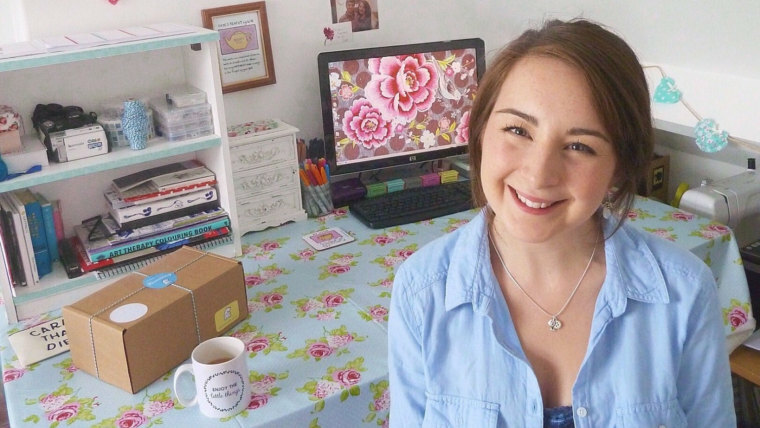 Self employment was a bit of a dream for me and I had no idea how to make it a reality. I heard about the Prince’s Trust through my mum. People were fundraising for the trust in the offices where she worked and had leaflets about the Enterprise Programme. She mentioned it and I went straight to the website to register my interest. How did you feel about the Enterprise programme prior to starting? I was a little apprehensive about the Enterprise programme prior to starting. Leaving the house was still quite difficult for me at that point and I had no idea how I would cope health wise with attending sessions. I had no prior business experience and only the loosest of outlines of a business idea. I was worried that my idea would seem silly and that I was signing up for something that was a bigger commitment than I could manage. From the very start, the Enterprise programme was great. I attended an informal information session where I learned a bit about the programme and met other young people who were interested in accessing it. The session was laid back and relaxed. I came away excited and inspired. I then attended an entirely free course which ran through a lot of business basics. With absolutely no business background, this was perfect for me and really accessible. I feel like I learned a lot about a variety of topics including book-keeping, tax, marketing and business planning. Attending the course was a huge personal challenge for me. There were times due to my health that I found it very difficult. When I was open about the difficulties I was having though I found the Prince’s Trust staff to be incredibly warm, supportive and accommodating. It was also lovely for me to meet other young people with a range of amazing business ideas and stories about how they came to be accessing support from the Prince’s Trust. Following the course, I attended a follow up session with another member of Prince’s Trust staff, Chris. Again, I found this session relaxed, accessible and inspiring. I left extremely motivated to proceed to the next step in the programme, writing my business plan. Over a period of several months, I had a series of one-to-one meetings with my assigned mentor, Greg. Greg helped me work through writing my business plan in a structured systematic way. This made the process far less daunting and kept me engaged and on track. Greg helped me to apply for a ‘Will it Work Grant’ which I could then use to test out my idea and see whether there was potential in my business. The fact that Greg and the Prince’s Trust had enough faith in my idea and planning to put money in was really important to me and helped a huge amount with my confidence. Working through the business plan a section at a time helped me to really get to grips with my business idea and what it would take to make it work. I learned a lot from analysing my market research and my period of test trading. Throughout the time that I was writing my business plan, my health was variable. Greg was always extremely understanding and encouraged me to work at my own pace, ensuring that my health came first. If I wasn’t up to a face-to-face meeting we would rearrange or schedule in a chat on the phone instead. If I had to cut a meeting short this was ok too and I never felt that my health was an inconvenience. Once my business plan was complete, I took it to ‘Launch Group’ where I talked through my idea and answered some questions about it. This was far less frightening than I thought it might be and it felt incredible to be launched as a Prince’s Trust business. It was also at this point that I found that I would be awarded a grant which I could use to fund some of the initial costs of getting my business off the ground. Again, this was a huge confidence boost and it was lovely to feel that the hard work I’d put In had paid off. Everybody I’ve meant from the Prince’s Trust at every point in the programme has been lovely, open and supportive. At no point have I felt that my health could hold me back. My personal needs have been accommodated at every step and I cannot sing the praises of the help I’ve been offered more highly. What do you think you’ve gained from being involved? Did it build your confidence? I’ve gained more from the programme than I can really put into words. At a surface level I suppose I’ve gained a better understanding of what it takes to run a small business and how to write a business plan. On a more personal level, I’ve gained a huge amount more. Since starting my business, BearHugs, I feel that I’ve got my identity back. When I fell ill, I lost my job, my independence and a great deal of my social life. With that I also lost a lot of my confidence. Engaging with the Enterprise programme has helped me realise that my health doesn’t mean I can achieve any less. I may not be able to be a Speech and Language Therapist now but I can still work in a role that benefits others while bringing me huge amounts of pride and fulfilment. What was your favourite part of the programme? My favourite part of the Enterprise programme would have to be working with my mentor, Greg. He has made the whole process relaxed and manageable for me from the very beginning. He’s been supportive when I’ve had setbacks and encouraged me when I’ve been less confident. I look forward to our meetings and always come away feeling positive and excited about what I can achieve. What do you think you would have been doing now without support? I have no idea what I would have been doing now if I hadn’t accessed support from the Prince’s Trust but it certainly wouldn’t have been running a business I can be as proud of as BearHugs. After a very busy Christmas period, I’ve just launched my website bearhugsgifts.com. It all feels very ‘proper’ and I could not love it more. I find it so satisfying seeing the orders come in, building the packages and then hearing that recipients’ days have been made. I’m working on some extra special seasonal gift boxes at the moment that I’ll be adding to my shop over the coming months. Did the Prince’s Trust Help? The Prince’s Trust helped a huge amount. The guidance provided has been invaluable and the grants I was able to access have gone a long way in helping me to make my little idea into a quite literally life-changing reality. My plans for the foreseeable future are to keep pursuing BearHugs. I’d love to see my little business grow with me as my health (fingers crossed) improves. Building the business myself means that it fits around my life perfectly. Should I need to take a step back for a while, I can. If I want to take it forward and turn it into something bigger, that’s an option too. The ball is entirely in my court and it feels good to be back in control again. What would you say to someone who was thinking about seeking support from the Prince’s Trust? Would you encourage them? I would absolutely encourage someone who was thinking about seeking support from the Prince’s Trust to go for it. I can’t believe the level of support that is offered entirely for free. I think the Prince’s Trust is a fantastic charity and I would recommend it to everyone. Faye, thank you so much! I was very interesting in how everything worked and now having opportunity to read this, can't be happier. I knew you were amazing, but as your Aunt I am biased!! However reading this through I can see what amazing support you have received from the Princes Trust and how much hard work everyone including yourself and Jared have put in. You are an inspiration in what you do and I am sure that the sound structure you have been given will last. Brilliant all round!! As you already know, just getting a lender to consider your business loan request is hard enough these days - but, to get one to provide your business capital at a rate that you feel is the most beneficial to your operations is down right impossible. TOP 10 We are really grateful for your blog post. You will find a lot of approaches after visiting your post. I was exactly searching for. Thanks for such post and please keep it up. Great work. blockchain Really appreciate this wonderful post that you have provided for us.Great site and a great topic as well i really get amazed to read this. Its really good. eseostore Really appreciate this wonderful post that you have provided for us.Great site and a great topic as well i really get amazed to read this. Its really good. vigrx plus It’s very informative and you are obviously very knowledgeable in this area. You have opened my eyes to varying views on this topic with interesting and solid content. เล่น sbobet ฟรี Really appreciate this wonderful post that you have provided for us.Great site and a great topic as well i really get amazed to read this. Its really good. $300 Bing Ads The next time I read a blog, I hope that it doesnt disappoint me as much as this one. I mean, I know it was my choice to read, but I actually thought you have something interesting to say. All I hear is a bunch of whining about something that you could fix if you werent too busy looking for attention. amazon gift card code Great tips and very easy to understand. This will definitely be very useful for me when I get a chance to start my blog. Handrails for terraces Wonderful illustrated information. I thank you about that. No doubt it will be very useful for my future projects. Would like to see some other posts on the same subject! Domaine de la Bretonnière Really appreciate this wonderful post that you have provided for us.Great site and a great topic as well i really get amazed to read this. Its really good. get quality coating agents in food additives from Echemi Easily, the article is actually the best topic on this registry related issue. I fit in with your conclusions and will eagerly look forward to your next updates. pipe fitting I am impressed by the information that you have on this blog. It shows how well you understand this subject. visas Just saying thanks will not just be sufficient, for the fantasti c lucidity in your writing. I will instantly grab your rss feed to stay informed of any updates. Hair Loss I really enjoy simply reading all of your weblogs. Simply wanted to inform you that you have people like me who appreciate your work. Definitely a great post. Hats off to you! The information that you have provided is very helpful. Cryptocurrency It’s very informative and you are obviously very knowledgeable in this area. You have opened my eyes to varying views on this topic with interesting and solid content. business Excellent Blog! I would like to thank for the efforts you have made in writing this post. I am hoping the same best work from you in the future as well. I wanted to thank you for this websites! Thanks for sharing. Great websites! Sobha villa gurgaon Thanks for your post. I’ve been thinking about writing a very comparable post over the last couple of weeks, I’ll probably keep it short and sweet and link to this instead if thats cool. Thanks. Salt lamp Hey what a brilliant post I have come across and believe me I have been searching out for this similar kind of post for past a week and hardly came across this. Thank you very much and will look for more postings from you. dog leash thanks for this usefull article, waiting for this article like this again. guitar tutor London I am really enjoying reading your well written articles. It looks like you spend a lot of effort and time on your blog. I have bookmarked it and I am looking forward to reading new articles. Keep up the good work.